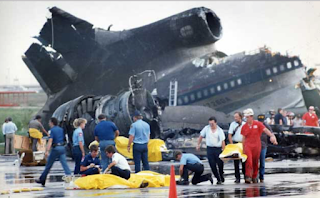 MSE Creative Consulting Blog: Aeronautical Malpractice? Flying Through a Hailstorm! Aeronautical Malpractice? Flying Through a Hailstorm! 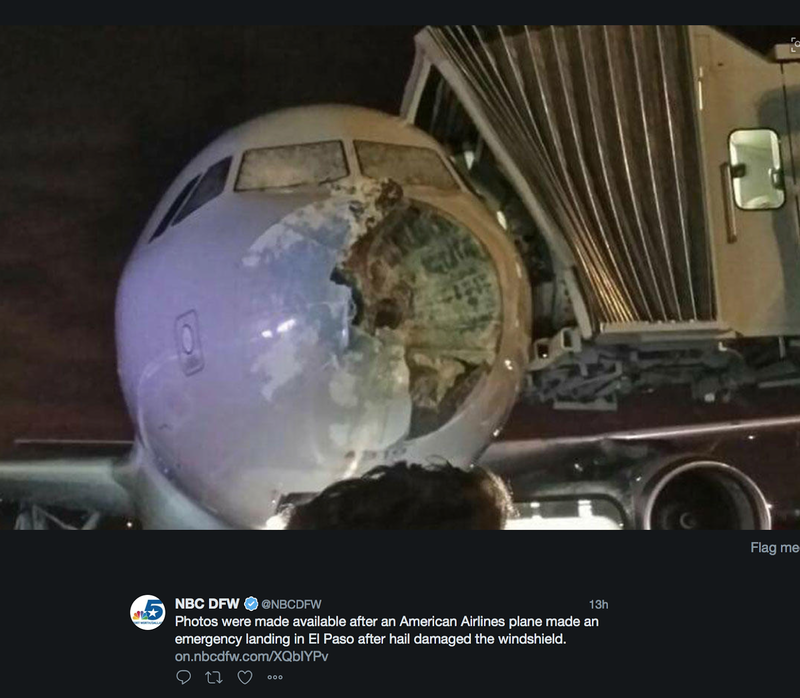 This is a photo (courtesy NBC News) of the Airbus that flew through a hailstorm over New Mexico Sunday evening as it was being operated as American Airlines Flight 1897. As you can see, the forward windshields are smashed in a way that would leave the pilots little visibility. 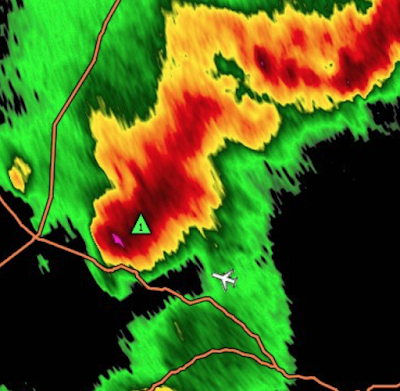 Other photos show the onboard weather radar was destroyed, leaving the crew unable to detect severe thunderstorms and putting the passengers at further peril as it maneuvered to make an emergency landing in El Paso. 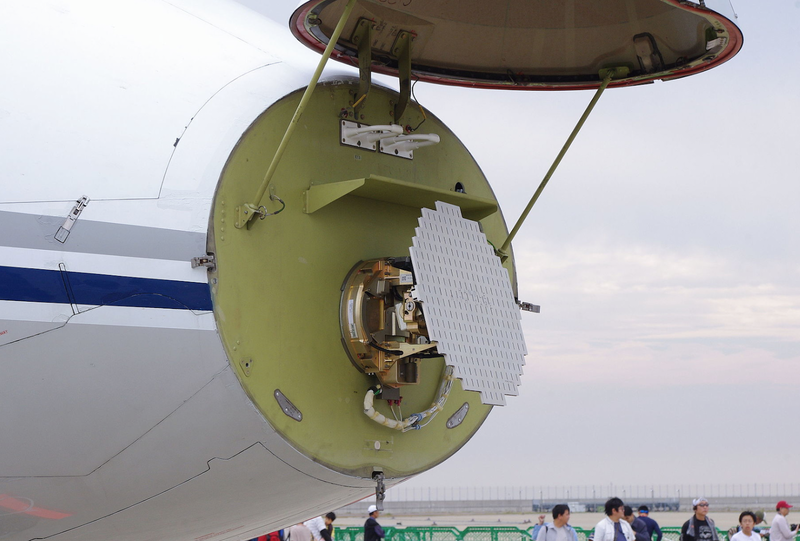 For comparison, I have put a photo of an undamaged radar and nose cone below. 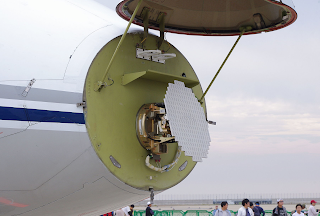 The antenna of an onboard radar. "Great work of our pilots"? If the pilots had done great work, they wouldn't have flown into this mess. I hope this is merely the work of AA's PR department and not the actual attitude of the airline. Let's look at what actually occurred. 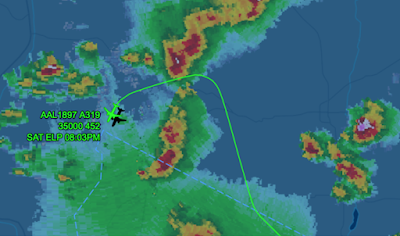 the path of the Airbus as it deviated north of its usual path to PHX, presumably to avoid the thunderstorms. Yet, it still flew right through a hailstorm. Courtesy of Stu Ostro, below are radar images of the position of the aircraft immediately before and at the time of the hailstorm encounter. The purple radar echoes are large hail. Passengers described the experience to local news stations, saying lightning and hail were visible out the window, and violent turbulence caused phones and drinks to go flying as people vomited and panicked. The crew, however, safely landed the aircraft even though the windshield and nose cone sustained heavy damage. While there are far too many of these unnecessary encounters with severe weather, this one is especially curious because the weather satellite imagery indicates the growing thunderstorm towers should have been visible to the pilots. We know it would likely have been visible because this image was taken 5-8 minutes before the encounter and one can see the shadow of the tower cast on the lower clouds. A popular weather radar instruction manual for pilots says that, when trying to pass between thunderstorms, the pilots should allow a 40 nautical mile (46 regular miles) interval. This wasn't even close to that margin. Why do these dangerous encounters keep occurring? An excellent question. 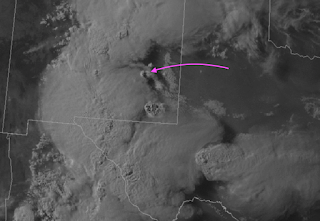 By deviating into Mexico, or farther north over New Mexico, these storms could have been completely avoided. While American would have had to pay a fee to use Mexican airspace, I'm confident that fee would have been a tiny fraction of what the hail encounter is going to cost. My opinion is, with the solving of the thunderstorm downburst problem in the late 1980's, airline pilots have gradually lost their fear of thunderstorms. That leads to needless (remember, this flight was running ahead of schedule) encounters with dangerous thunderstorms. Wreckage of Delta Flight 191 after an encounter with a downburst. Dallas-Ft. Worth Intl Airport, August, 1985. But, Mother Nature doesn't care. 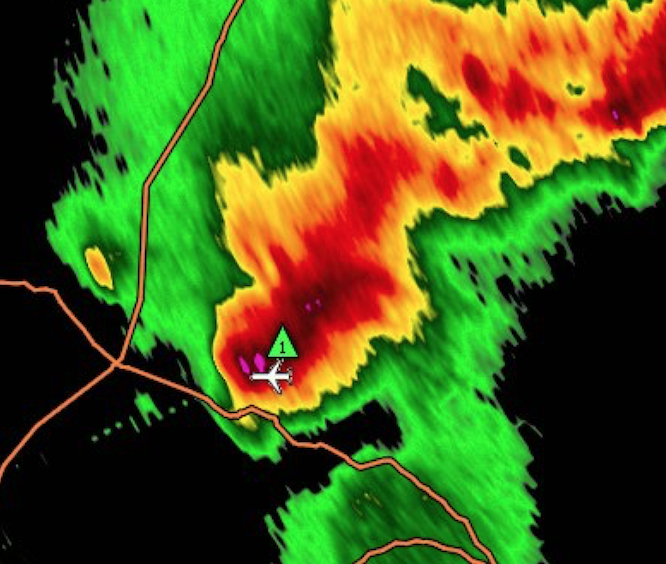 Given the the encroaching darkness, the destruction of the radar, and the lack of visibility, it was entirely possible that American Flight 1897 could have wandered into another thunderstorm on its way to its emergency alternate airport, El Paso, with, perhaps, catastrophic results. In my opinion, it is well past time for America's commercial airlines to update and reinforce thunderstorm avoidance training for their flight crews.